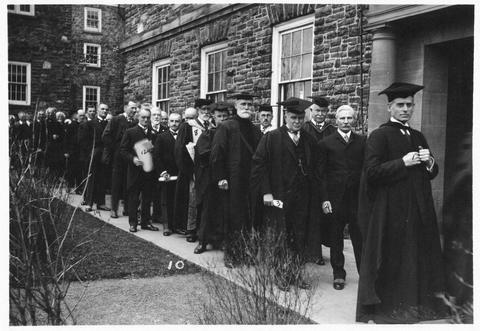 Item is a photograph of a procession at the 1926 spring convocation ceremony at Dalhousie University. The photograph shows J. C. Webster (L.L.D. ); G. S. Campbell; I. Gammell (L.L.D. ); Prof. H. HUrray; Dean Read; Bishop Correll; Prof. H. A. Kent; Dr. J. Stewart; General Thacker; C. H. Mitchell; G. F. Pearson; D. Cameron; and P. A. Bonet (Consul) walking in a procession by a stone building.